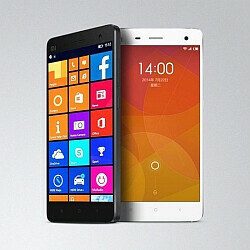 A new video leak from China shows the Xiaomi Mi 4 running Windows 10 Mobile build 10240, a preview version of the mobile OS that Microsoft released six weeks ago. Earlier this year, Microsoft announced its intentions of bringing Windows 10 Mobile to Android in the form of a custom ROM. Since then, the Windows 10 Mobile has been made available in a limited beta form for some owners of the Xiaomi Mi 4, the test device for this venture. The five-minute video shows the Xiaomi Mi 4 running on Windows 10 Mobile build 10240 performing various basic tasks such as navigating through the user interface, browsing through a few social networks such as Weibo and QQ, loading up web pages in the browser, or playing a game. From what we can tell, the handset is quite responsive, and we couldn't spot any major hiccup. That's exactly what you'd expect from a Windows 10 Mobile handset running on the Xiaomi Mi 4's high-end hardware. Note that the early - and limited - beta officially rolled out to Xiaomi Mi 4 owners in June. Just days before the launch, we've seen a leaked preview of Windows 10 Mobile running on the smartphone back in late May. Compared to this more recent leak, that preview was much more on the basic side of things. With Windows 10 Mobile not officially launched yet, it's probably too early to tell when Microsoft might launch a more widely-available preview of its custom Android ROM. Its more secure and efficient than android. You are in denial. Android is much more vulnerable to malware than Windows Phone. Windows Phone has never been compromised or infected with malware thus far. Every year at black hat conferences there are hacking competitions, and every year Android and IOS are compromised within hours whereas Windows Phone and Blackberry remain uncompromised. I used to be disliked tiles, but with that completely transparent tiles looks cool. Microsoft needs Xiaomi like companies at its side for Windows 10 mobile, so it wouldn't be condemned to weak hardware like SD4xx with 1GB RAM at relatively high prices. Instead to trying to convince people their OS doesn't need powerful hardware, they can reach crowds with powerful hardware at affordable prices. People would be more willing to give it a try and if it gains market share more apps will trail it.